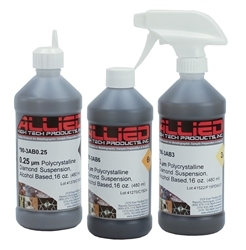 Allied High Tech - MultiPrep™ Polishing System - 8"
Equipment > Grinding & Polishing > MultiPrep™ Polishing System - 8"
The MultiPrep™ System enables precise semiautomatic sample preparation of a wide range of materials for microscopic (optical, SEM, FIB, TEM, AFM, etc.) evaluation. Capabilities include parallel polishing, angle polishing, site-specific polishing or any combination thereof. It provides reproducible results by eliminating inconsistencies between users, regardless of their skill. Dual micrometers (pitch and roll) allow precise sample tilt adjustments relative to the abrasive plane. A rigid Z-indexing spindle maintains the predefined geometric orientation throughout the grinding/polishing process. Digital indicators enable quantifiable material removal, which can be monitored real-time, or preset for unattended operation. Variable speed rotation and oscillation maximize use of the entire grinding/polishing disc and minimize artifacts. Adjustable load control expands its capability to handle a range of small (delicate) to large samples. 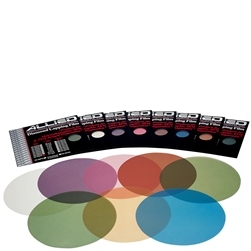 NOTE: Precision/Magnetic Platens, Fixtures and Accessories are SOLD SEPARATELY. Please choose from the list of accessories below to ensure a complete system is configured for quotation. 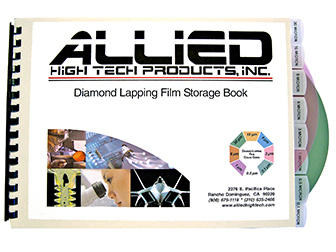 Diamond Lapping Film Discs - 08"